Scorpion control in Scottsdale and elsewhere in Arizona can be difficult. Like most kinds of pests that can invade your home, it is tough to know if you have scorpions or how they get into your home. Once they are in your home, getting rid of them can be a chore that usually calls for a good Scottsdale scorpion control service. It is easy to get discouraged when you find that you have to deal with a scorpion infestation, but you should not lose hope if you find one of the stinging arachnids in your house. While you may have to call on a good pest control service, there are a few things you can do beforehand. Scorpions mostly live in warm, dry climates, which is why infestations are so common in Scottsdale. As with most problems, the best way to deal with a scorpion infestation is to prevent it in the first place. This is easier said than done of course, but it helps if you remove bushes, trees and anything that could provide homes for scorpions that are too close to your house. It also helps to seal up any gaps in your home, especially those along your home’s foundation. This can be done with weather stripping with relatively little money and effort. Scorpions are nocturnal, meaning that they are mostly active at night. This also means that you are unlikely to see one in the middle of the day scurrying across your floor. Scorpions normally are not that aggressive and only sting when they feel threatened, which is why they are most likely to sting after someone unknowingly disturbs them. Scorpion stings are not very dangerous to a full grown and healthy adult, but they are painful. A scorpion sting will begin to hurt almost immediately, and you may develop a welt. The venom is not that dangerous to an adult, but a sting does call for medical attention, especially if it is a child who is the one that got stung. If you see a scorpion in your home, leave it alone. Make note of where you saw it, and try to determine if it could have come through a gap somewhere on the outside of your home. Check your shoes and other clothing before putting them on since they can provide good hiding places for a scorpion. 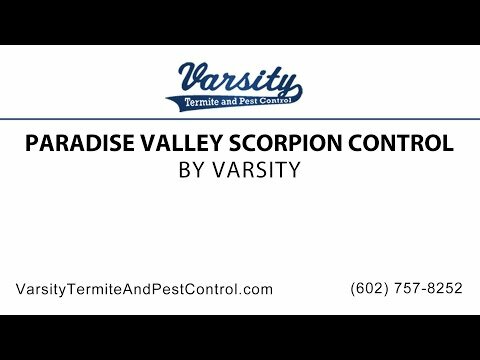 Some people try to control a scorpion infestation with glue traps, bug zappers and other common remedies, but the safest and most efficient way to handle a scorpion infestation is to contact a pest control service such as Varsity Termite and Pest Control. They can provide excellent and thorough scorpion control in Scottsdale and the surrounding areas, so contact us today for more information or any other questions you may have for us.